Lyme Disease is the number one vector borne illness in the US and in the US armed forces. Lyme Disease bacteria have developed multiple methods to become resistant to antibiotic treatment. These methods are believed to be the cause of relapsing symptoms of fatigue, brain fog, inflammation, and pain in chronic Lyme disease patients despite months or years of antibiotics. Fortunately, research has identified essential oils that kill drug persistent Lyme disease bacteria in lab studies. In the clinic, electrical microcurrent frequency treatments, cold laser, microparticle liposomal herbs, and cupping have significantly reduced neurological and toxic symptoms in patients diagnosed with Lyme disease. At our clinic, we have successfully treated hundreds of patients diagnosed with Lyme disease and multiple tick borne co-infections. At the "Getting Rid of Chronic Lyme Disease" lecture we'll also be sharing how innovative treatments like electrical frequency scans help to identify underlying issues, optimal treatments and remedies for each person. "Essential oils have the unique ability to penetrate through biofilms to get to the hidden forms of Lyme disease and co-infections," - Greg Lee, President Two Frogs Healing Center. He will be sharing about the huge improvements that patients have received through essential oils and other treatments at the Getting Rid of Chronic Lyme Disease talk on Wednesday August 1st. The Two Frogs Healing Center has been a provider of natural remedies and treatments for helping patients to stop their persistent infections including Lyme disease, viruses, mold, bacteria, and parasites. Using advanced electrical scanning technology, Two Frogs is able to identify the signatures of underlying pathogens that are causing relapsing symptoms. Two Frogs also produces targeted, customized, natural remedies to address multiple chronic infections, toxins, and painful symptoms. Its treatments and remedies encompass Frequency Specific Microcurrent, cold laser, acupuncture, cupping and bloodletting, craniosacral therapy, targeted Liposomal remedies, essential oils, homeopathic remedies, antimicrobial herbs, and detoxification supplements. 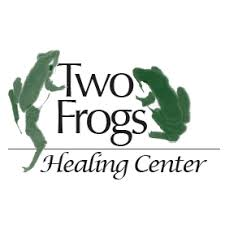 The Two Frogs Healing Center has served the Lyme disease community since 2006 and has a clinic in the Frederick Innovative Technology Center Inc. For more information, visit http://www.GoodbyeLyme.com/events/get_rid_lyme.